This is going to be a shorter blog post – I’d just like to talk about refactoring one mechanic to work a little differently, since I think it’s an interesting one, and thinking it through gave me some trouble. One of the things you do in the game is go to the fringes of the Sector and “salvage” various derelicts – abandoned stations, Domain-era probes, and so on. It’s a good source of valuable materials and lost technology. 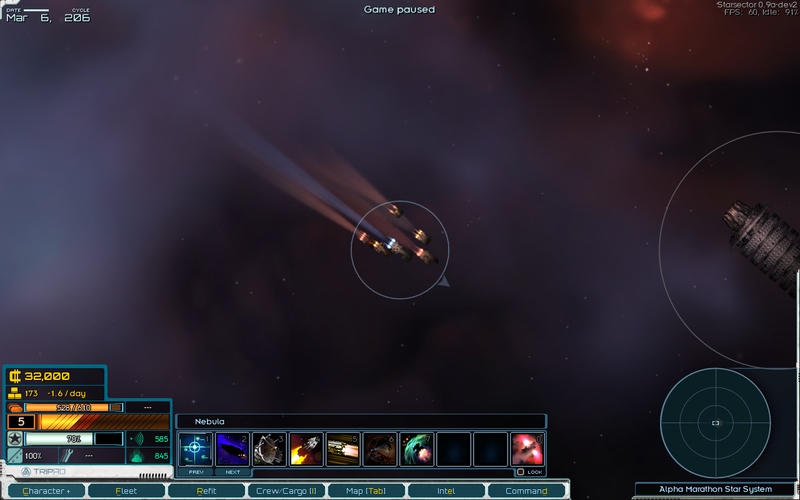 With the next release, salvaging will become even more important, since it’ll be the primary way for the player to get ship and weapon blueprints that in turn feed into the manufacturing capabilities of their colonies. This is definitely workable. The main issue is that the amount of salvage without investing points into the skill is too low, but that can be tuned because it’s just a numbers issue. Or… is it? The reason why the numbers don’t work is with the way it’s set up, it’s hard to get a clear assessment of what the relative salvage values are. You’ve got to look at the results of a “proper” salvage operation, with possible bonuses from Salvage Rigs, and maybe scavenging through the resulting low-density debris field, vs blowing the derelict to pieces and scavenging through the high-density debris field multiple times. If that’s hard for me to work out, it’s a good bet it’s not any easier for the player. A secondary issue is that Salvage Rigs only make sense to bring along if the player also invests into the Salvaging skill; otherwise they have no effect. It’d be pretty easy to redesign salvaging if those were the only two things to worry about. However, we’ve also got a few other goals, which resulted in the original design. There are two goals that are fundamentally at odds with each other. One is that it’d be nice for salvaging to be something the player can specialize in – thus the skill, being able to add Salvage Rigs (and other ships with a similar bonus) to your fleet, and needing crew and machinery. The other is that once a player finds a derelict to salvage, we don’t want them to feel like it would be a waste to do it right then. Derelicts are a limited resource – there are only so many of them in the Sector, and now they’ll also be a source of blueprints and other highly valuable items that are difficult or even impossible to acquire otherwise. If the player feels like they can’t start salvaging until they’ve got the maximum number of Salvage Rigs and so on, that’s a problem, especially since salvaging is meant to be a good way to get off the ground early. If they find a high-difficulty derelict and feel like they need to come back for it later, that’s also a problem, since coming back to a system that’s most likely been cleared of any dangers is often going to be a chore. So: we want the player to be able to specialize in utilizing a limited resource, but also not feel like they they can’t start making use of the resource without being fully specialized. The original design solves this in two ways. One, due to how the skill system works, maxing any one skill is quite easy. Thus, waiting to max out Salvaging isn’t much of a wait at all, and primarily the player just has to decide whether they’re going to max it out or not. In either case, they’re free to salvage without worry of it being more efficient to do later. Two, Salvage Rigs only affect the various commodities found during salvage – such as fuel and supplies – and not the more rare items. So, nothing irreplaceable is lost by not having a bunch of Salvage Rigs right off the bat, and, for example, going back to get some and then coming back to a derelict will cost fuel and supplies, so in most cases it wouldn’t be worthwhile. There’s also another goal – for a skill investment to be worth it, it has to provide more than just a bit more income. It has to provide something that remains valuable all game, even after the player is largely done with the salvaging portion of it. Since breaking up a derelict produces less salvage overall, it also produces fewer special items (which have long-term uses and effects), and so that is accomplished. The new system, if we can even call it that, is entirely about smoothing away the rough edges. 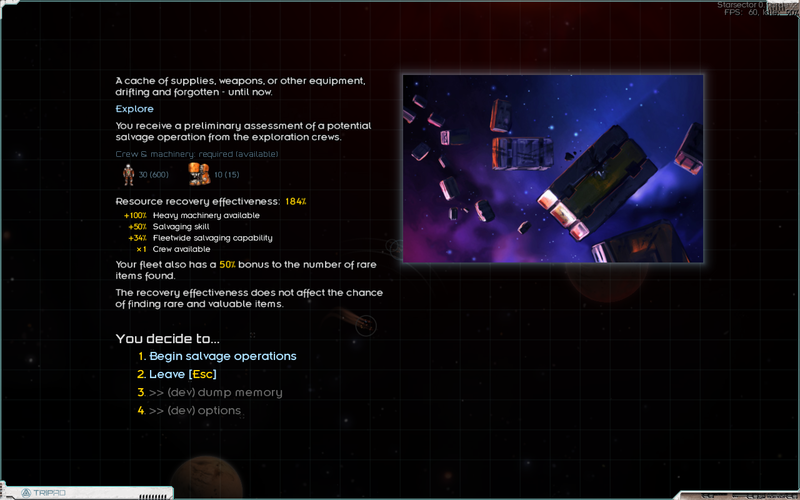 The “salvage difficulty rating” exists to indirectly affect the quantity of special items found during salvage operations. So, radical idea: the Salvaging skill directly affects the number of special items found (as well as “regular” valuables), and the difficulty rating no longer needs to be a player-facing stat at all. In turn, this means we can remove the “blow this up into a debris field” option, since anyone can just run a proper salvage operation. This simplifies things, and makes it a lot easier to compare the options and evaluate the value of the skill. We can now directly see that, hey, salvaging with the skill means 50% more special items, vs salvaging without. Post-salvage scavenging through the debris remains an option, but since it’s the same with and without the skill (aside from the 50% “more stuff” bonus), it’s no more difficult to evaluate. 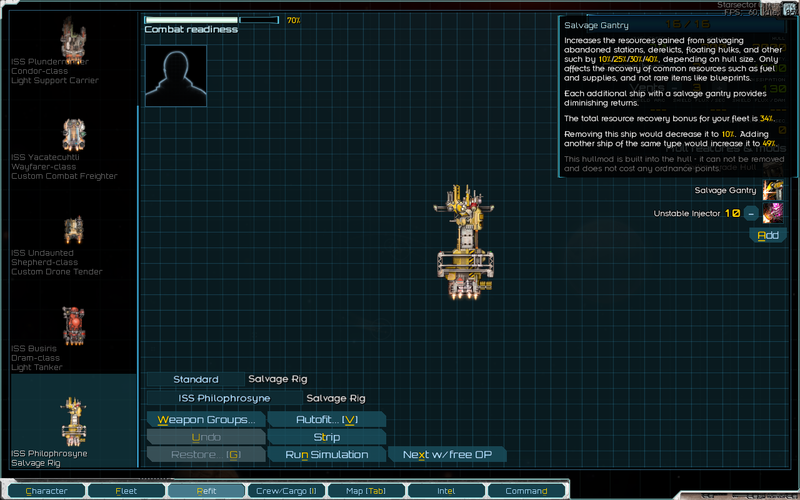 This just leaves us with Salvage Rigs, and other ships that provide a bonus to salvaging. For the same reasons as before, these only affect “regular” salvage, not special items. In addition, we don’t want the player to have a fleet of, say, 20 rigs, a tanker, and a freighter, and to then make obscene amounts of credits salvaging minor derelicts. Before, this was accomplished by capping this bonus by the salvage difficulty, but that’s no longer there. Thus: the bonus provided by these kinds of ships suffers from diminishing returns. The player can decide where in that range they’re comfortable with, but as the rigs have ongoing supply and fuel costs, there’s a definite upper limit to how many are worthwhile to have. And, of course, they’re useful regardless of whether the player has invested in the Salvaging skill or not. And there you have it! All in all, I’m happy with how this has turned out – it’s both much more clear, and does more than the original design mechanics-wise. This entry was posted on Thursday, September 6th, 2018 at 5:30 pm	and is filed under Development. You can follow any responses to this entry through the RSS 2.0 feed. Both comments and pings are currently closed.